Ever watch the reality game show Survivor? Every season the biggest obstacle for each tribe is starting a fire so that they can have clean water, cook food, and have some warmth during the cold nights. I purchased this flint stick thinking that when I go portaging I would be able to light a fire without a lighter or matches. Man was I wrong! All you have to do is scrape the stainless steal against the flint and the sparks fly. It is very easy to use in that sense. 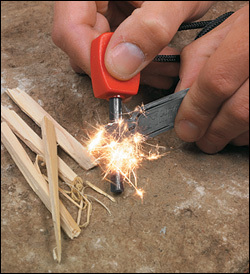 But when I would put some paper, dried leaves, or wood shavings down the sparks would simply disappear before catching any of the material for a fire. That being said I am by no means a professional outdoorsman and I really didn’t know what I was doing other then to logically think the sparks would land on the leaves or wood and would create and amber. From there I could build around it, blow a little and the flames would come. Unfortunately nothing even close to that happened and my patience grew thin. I quickly grabbed the lighter and had a blazing fire going in minutes. 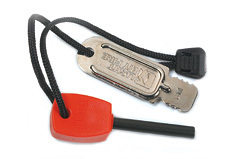 I would suggest that this is probably a nice little gift for a camping friend, but unless you really know what you are doing you will probably end up like me not having the patience for it and just use your favourite lighter or weather proof matches.